Rosso di Montalcino DOC and Brunello di Montalcino DOCG, and this was realised in 2009 when the Querce Bettina wines were first released. 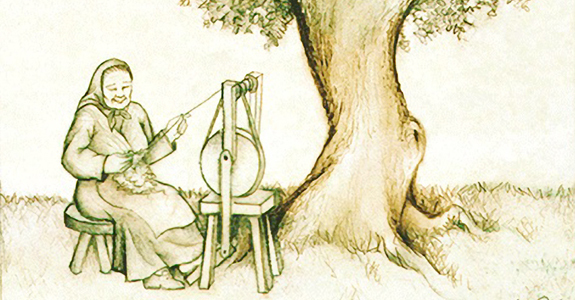 T he name Querce Bettina comes from a local legend dating back to the late 19th Century telling of a kind old lady who sat under an imposing oak tree (Querce) spinning wool and telling eccentric stories of witches and wizards to young shepherds that passed by. The lady’s name was Bettina, she was elusive and nobody knew where she lived or came from; she just used to appear and disappear at will leaving a wake of mystery behind her. Everybody used to say they had met Bettina at least once, but if asked where exactly, they would say ‘oh, you know, near Querce Bettina’. For several years, Querce Bettina has been working closely with the Italian association ‘Vino e Salute’ that promotes the benefits of a healthy Mediterranean diet accompanied by a good glass of red wine. The associate members are doctors and research scientists from the Universities of Siena, Pisa, Florence and Chieti and they conduct research in the genetics of taste as well as the benefits of polyphenols, antioxidants and resveratrol all of which are present in red wine. A guided visit and tasting can be arranged even for small groups, please contact us to book. Add your name to our mailing list to receive our Newsletter.